There is a enough to go around. There IS ENOUGH. Period. No lack. No shortage. No need to strive and hustle for our place at the table. Another woman’s breakthrough does not mean it is your defeat. Another woman’s bright light does not mean yours is dimmed. Another woman’s success is not your setback. Another woman’s breakthrough is not your breaking. 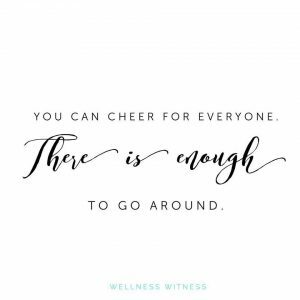 We get to CHOOSE to cheer one another on instead of competing. And that can only happen when we know and believe there is no lack and that we get enough. There IS enough to go around. If our goal is His glory, then her win can be our win. Her victory can be our victory. Her bright light can make us all shine brighter. I don’t sit here telling you these things as if I’ve got it mastered. I sure don’t. I still struggle with jealousy, bitterness, and feeling left out or overlooked. I feel those things, but I refuse to BE those things. -God knows what He is doing and He can use ALL things for good. I can trust Him. -His plans for my life are good, and that includes sanctification. This means His priority isn’t for my to be more happy- it’s for me to be more holy. Dying to self is a big step in that direction. -Prayer is a sharp weapon to be utilized. Feeling left out, overlooked, or disregarded? I challenge you to pray blessings over those who are walking in the territory you want. Pray for their ministry, their family, their calling, their workplace. Take back territory the enemy is trying to steal and pray blessings over her and her life. Things will shift. Sometimes I don’t want to. To be honest, many times I don’t want to. But, I know what happens on the other side of my obedience: BREAKTHROUGH. So get out there & CHEER SOMEBODY on today. Tell her you appreciate the work she does that no one notices. Tell her that her leadership makes your community better. Tell her that the gifting of the Lord in her life is beautiful. Celebrate her accomplishments even if its something you want for yourself. There is no lack. We get enough. Cheer her on!